Summer is the perfect time to crack open a book and allow yourself to be removed from the stresses of every day life. Today, people spend most of their time looking at a TV, Laptop, Desktop Computer, Smart phone, Ipod, and so on. So much screen time is not good for your eyes. If you’re looking for a book full of crime, romance, mystery, and fashion, I have the perfect book for you. I recently took a book out from the Hoyt Library called Death On Heels. 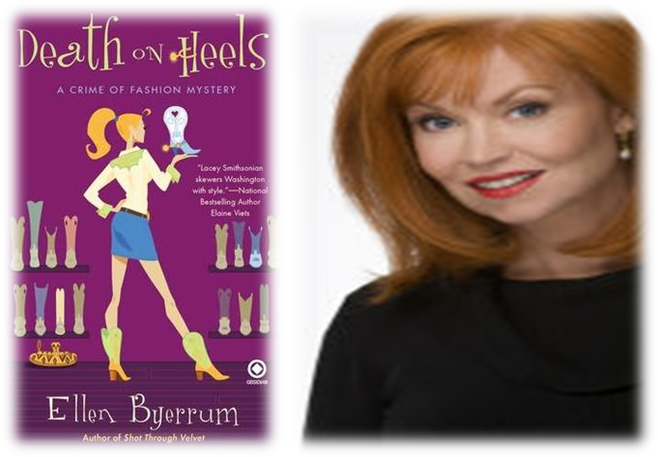 The book was written by Ellen Byerrum, who has written several “Crime of Fashion” books with Lacey Smithsonian as a journalist with a detective’s eye for fashion clues. In this book, Lacey Smithsonian finds herself stuck between a rock in a hard place. Her former boyfriend and dashing cattle rancher Cole Tucker is charged for the murder of three young lively young women. Her heart and mind a certain the man she once loved was not capable of murder. As a result, she decides she must see Tucker. Her quick ten minute interview with the handsome rancher sporting a brown jump suit would go a lot further than she expects…. Now that I’ve peaked your interest, I will not spill any more details about the book. I don’t want to ruin it for you. Instead, I’ll let you in on the things I liked without giving away the climax of the book. Mrs. Byerrum is a very descriptive writer. This comes out in her descriptions of the setting as well as the clothing she describes through Lacy Smithsonian’s eyes. Those familiar with the Crime of Fashion series will know that Lacey Smithsonian is a fashion journalist. Fashion bloggers can appreciate her attention to detail. They also wish they didn’t read her witty clever articles that are scattered strategically throughout the book. Her articles are relevant, entertaining. By reading the series, you won’t miss on the fashion tips you’d get from a fashion blog. Your need for fashion forward advice is still within reach. There is more to the book that benefits its reader. At a glance, a person might assume Death on Heels are about stilettos. The cover art makes it clear it’s about cowboy boots.In this particular book, the mystery revolves around custom-made cowboy boots. Specifically, women’s cowboy boots. As a result, the reader is able to obtain a lot information regarding fashionable boots that are not used for their original use. It is common knowledge that blue jeans were created for laborers, specifically in the agriculture industry. Today, everyone wears them and they are a key fashion staple. These boots were meant for men and women working within the terrain of the midwest. Today, they have boots for authentic cow boys and fashionable cow girls. The missing boots in these murders are not boots you’d find easily on the east or west coast. The common person may not realize how they can be used to make a fashion statement. 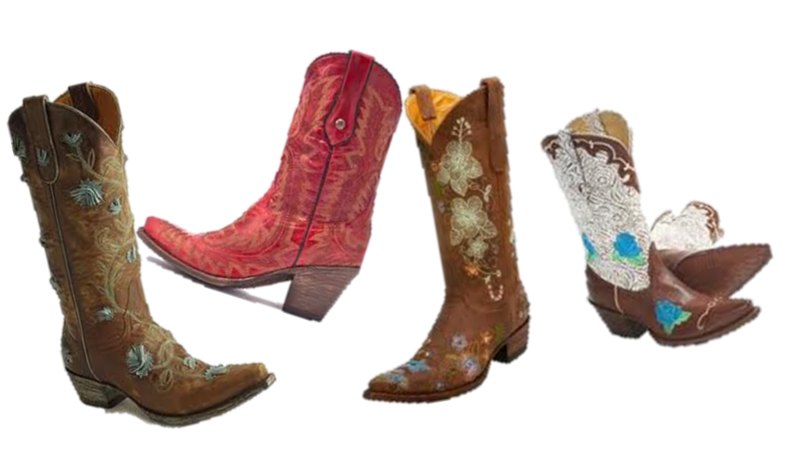 By the end of the book, she may picture her own pair and search for more information regarding cowboy boots. Overall, I give the book five stars. It was a quick read. Lacy’s friends and family added humor and love to the book. It was difficult to find out who was behind the murders. Importantly, I could tell a lot of time and effort went into this book. I am thankful the Hoyt Library had a copy of Death on Heels. My next read is Raiders of the Lost Corset. Sadly, I am not going in order. This is the price I pay for using the local library. If my library does not have the remaining series. I’ll have to check Barnes and Knobles as well as Amazon to read the rest. If you are interested in taking a break from technology without giving up your daily dose of fashion, feel free to click GoodReads to find more fashion forward mysteries. Many of the books listed were written by Ellen Byerrum, Elaine Viets, and Chloe Green. Their cover art is enough to entice you to pick one of their many books up. Besides, a break from technology helps stimulate the mind. You may find inspiration in one of these books. Just one book from Ellen Byerrum can spark your imagination and creativity. If you’d like to contact her directly, there are a few ways to do this. Mrs. Byerrum has a Twitter, Facebook, blog, e-mail adress, and website. Do you like books that contain fashion and mystery? Would you like to see more fashion book reviews on Magnify Your Style? Live in Kingston and don’t have a Luzene County Library Card, then visit the Hoyt Library!